With the much anticipated ruling on the legal status of gay marriage on the horizon, I think it is a good time to dive into an uncommon analysis of the Supreme Court of the United States (SCOTUS). 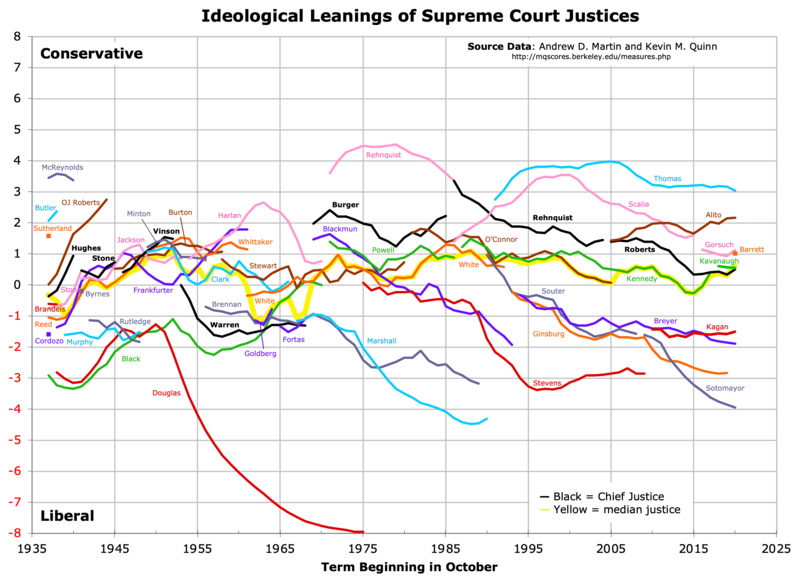 I hope to make this post part of a series focused on the dynamics of the SCOTUS over time and over topics. For the first post of the series, and for the first post of my blog, I focused on the current court, which formed on August 7, 2010, when Elena Kagan was confirmed by the Senate. From August 2010 until July 2014, there were 316 recorded SCOTUS rulings. First, I want to dispel some notions. I originally posted a SCOTUS agreement network a few months ago on my favorite subreddit r/dataisbeautiful. While many thought the graph was visually appealing, some took issue with the fact that my network did not accurately portray agreement within the SCOTUS. Admittedly, there was some truth in that claim. I originally took the data from a New York Times article, which presented a voting agreement matrix for all the Justices. Just as the NYT article scaled their colors to fit the range of agreement levels, with the minimum (66% agreement) receiving the lightest hue and the maximum (91% agreement) receiving the darkest hue, I too scaled the edges in my network to make it more visually interesting. I did not do it out of malice or political motivation, but instead as a choice of, what I thought was, effective visualization. With such a small range of agreement levels, it would have been difficult for the eye to distinguish differences in edge thickness and the graph was intended as a relative visualization, not an absolute one. Unfortunately, selecting such a visual effect also downplays the lower-end agreement levels, making, for example, Justice Thomas and Justice Ginsburg appear as though they almost never agreed. To avoid some of this confusion, I will present what I hope is a more transparent analysis of the SCOTUS by first highlight that the SCOTUS does agree more times than not. 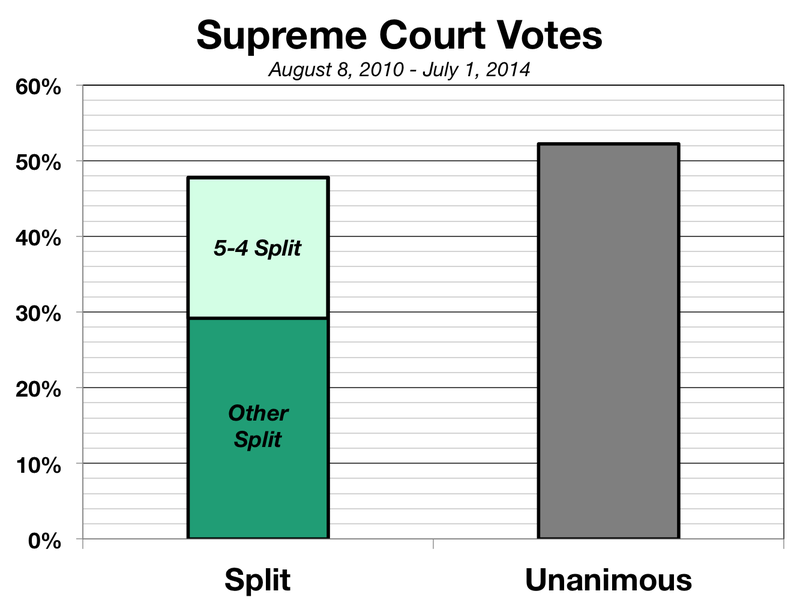 In fact, the SCOTUS hands down unanimous decisions 52% of the time. On the other hand, the oft-highlighted and (perhaps) infamous 5-4 split decision occurs only 19% of the time. Eigenvector centrality scores for each justice of the current court. 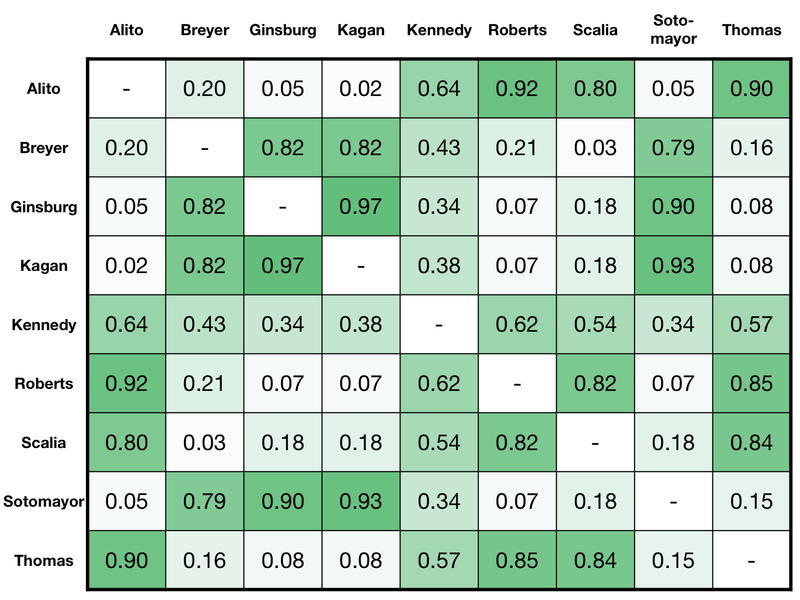 The general level of consensus among the Justices is aptly reflected in their eigenvector centrality. In short, eigenvector centrality is a metric used in graph theory and network analysis that assigns a relative importance to a node. A node’s “importance,” or “influence,” is determined by how connected a given node is to all other nodes in the network, taking into account the value of each edge and the size of each connected node. (Google’s pagerank uses this concept.) Eigenvector centrality is bounded between 0 and 1, with 1 being a highly central node. In this case, we see that all the Justices are very central, which makes sense given that all justices with one another regularly—even Thomas and the Notorious RBG agree over 60% of the time. Warning: network edges and centrality scores presented after this point are proportionally scaled. In the graph below, we can see the agreement patterns among the justices for all cases, unanimous or otherwise. Justice nodes are colored by the political party of the president who appointed them. 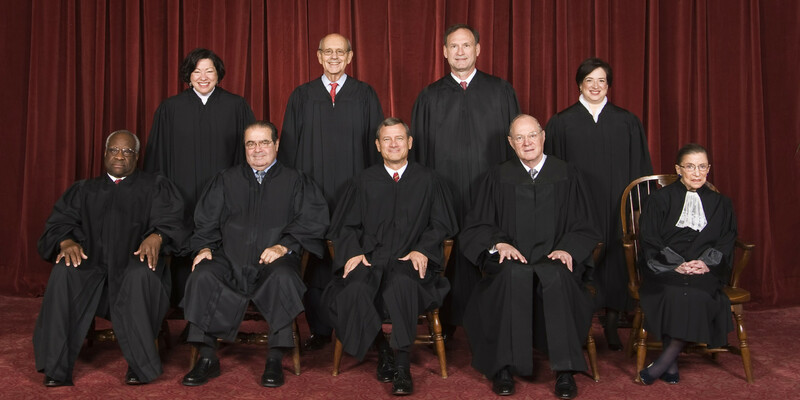 Justices are blue if appointed by a Democrat and red if appointed by a Republican. Traditionally, those appointed by Democrats are thought to be liberal and those appointed by Republicans are thought to be conservative. 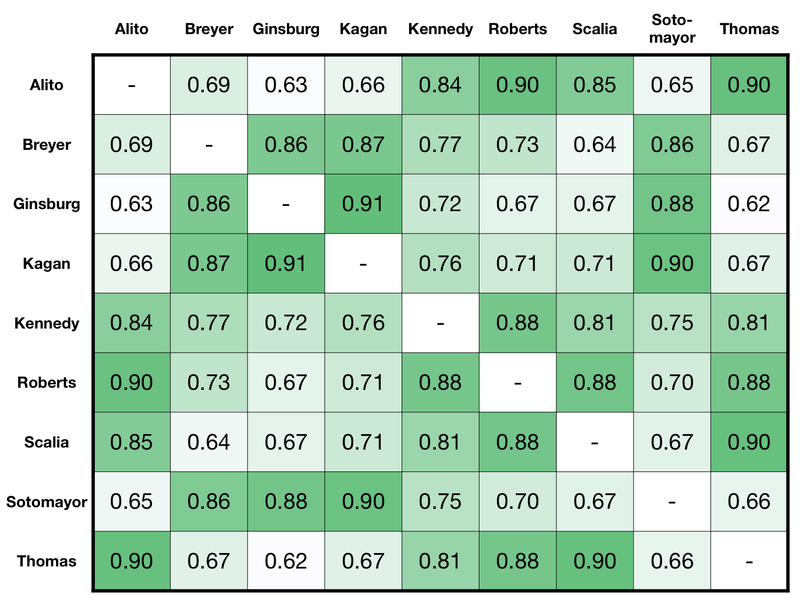 Edges are proportionally scaled, with the edge between the two justices who agree the least being the thinnest (I swear there’s an edge between Thomas and Ginsburg, it’s just hard to see at this resolution) and the edge between the justices who agree the most being the thickest. In this network, we see a minimum level of agreement between Ginsburg and Thomas (62% agreement) and a maximum level of agreement between Ginsburg and Kagan (91% agreement). Notice that those levels differ from the NYT analysis, which may have used a different time frame or slightly different method for counting “agreement.” A few interesting patterns emerge. First, there is a noticeable divide between the liberal wing—Breyer, Ginsburg, Kagan, and Sotomayor—and their conservative counterparts. Second, while Roberts seems to sit within the center of the conservative wing (he is Chief Justice after all), he still has significant agreement with the liberal justices, although seemingly not as much as Kennedy, the stereotyped swing voter. Decision agreement network amongst the current Supreme Court Justices on all case decisions. Edges are proportionally scaled between the minimum and maximum values. Agreement matrix for all cases. Okay, so I’ve shown you the “big picture.” Now let’s get down to the more tantalizing stuff. Here I present the 151 cases in which there was a split vote. The split decision could range from an 8-to-1 vote with a lone dissenter to a more contentious 5-to-4 decision. I find split decision cases more interesting because I imagine they highlight the ideological differences among the justices. Below you will find the agreement network for split decisions. Again, edges are proportionally scaled. I kept the network layout algorithm settings the same and you will probably note that the network is more spread out than the last one, which is due to the fact that this network is not buffered by all the unanimous decisions and thus allows for less uniform levels of agreement among the justices. Our most agreeable pair is once again Ginsburg and Kagan (81% agreement); however, this network features two minimum agreement pairs, Ginsburg-Thomas (22% agreement) and Alito-Ginsburg (22% agreement). Again, we see Justice Kennedy being Mr. Swing Vote and agreeing across the aisle (not Congress, I know), but interestingly Chief Justice Roberts is also quiet an agreeable guy in these situations. I am not familiar enough with the inner workings of the SCOTUS to discern whether Roberts’s status as Chief Justice influences the instances in which he is in the majority on cases. If it does, that would perhaps explain why he seems to agree with the other justices more than we would expect. 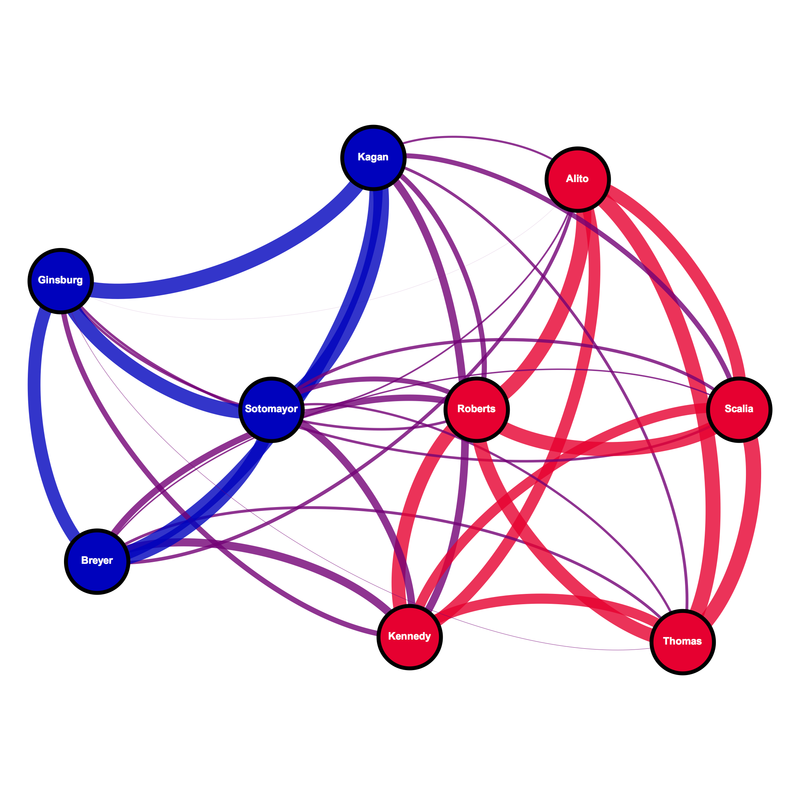 Decision agreement network amongst the current Supreme Court Justices on split (i.e. non-unanimous) case decisions. Edges are proportionally scaled between the minimum and maximum values. Agreement matrix for split decision cases. I wanted to see how each justice’s centrality in the network related to their ideological leanings. To do that, I scooped up the justices’ Martin-Quinn ideology scores from a database hosted by UC Berkeley. The dataset provides an annual posterior-mean ideology score for each justice up through 2013. Negative values denote liberal ideology, while positive values denote conservative ideology. I produced an ideology score for each justice by averaging their annual ideology scores across the years of the current court. Next, I produced an expected centrality metric based on their ideology. Median voter theorem posits the importance of the most median ideology as a swing vote. In this case, the ideological center of the current court is Justice Kennedy, with a mildly conservative ideology score of 0.51, and median voter theorem would predict that he is the court’s swing voter. This assumption can be found in the graphic below, which highlights in yellow the justice who is the ideological median. Using the assumption that the most median ideology will be the most central due to its swing vote tendency, I calculated the standard deviation of each justice’s ideology from Kennedy’s and normalized these values between 0 and 1, with 1 being the median (Kennedy) and 0 being the justice who is the farthest from Kennedy ideologically. As a result, Kennedy was predicted to be the most central (i.e. agreeable) justice with a predicted normalized centrality of 1.00, while Thomas was predicted to be the least agreeable with a predicted normalized centrality score of 0.00. Next, I compared the predicted centrality scores to each justice’s actual normalized centrality (again scaled between 1 and 0). Interestingly, Chief Justice Roberts is actually the most agreeable (central) justice in split decision cases. This seems to contradict the common quip of Justice Kennedy as the swing vote. Also interesting, Justice Thomas ended up being significantly more central than predicted, while Justice Ginsburg ended up being the least central. It seems that part of the reason that the more conservative justices are more central than expected is due to the fact that conservatives form the majority in the current court and thus are more likely to form the majority on cases. Similarly, we can see that the liberal justices, with the exception of Sotomayor, were less central than expected. Again, I think this has to do with the fact that they are less likely to be in the majority in a conservative court. Table showing the normalized centrality scores as predicted by ideology score and as found in the split vote network. To truly get down to the question of swing voting, I narrowed down the data to just those 61 cases in which there was a five-justice majority. This provides an opportunity to see cases in which one justice’s decision to vote one way or the other can truly determine the outcome of a SCOTUS case. Once again, you will note that the agreement network (below) is even more dispersed than the previous one, highlighting the least uniform levels of agreement in this analysis. 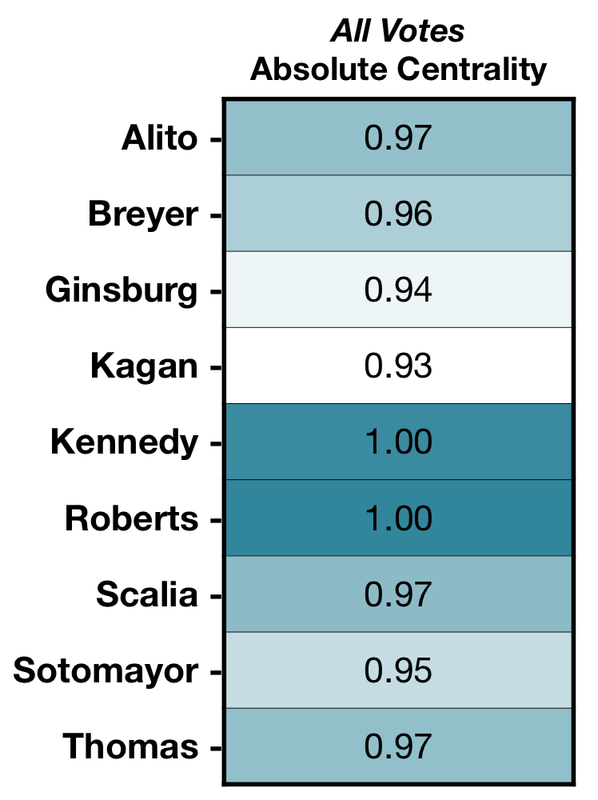 Kagan and Ginsburg agree in 97% of 5-4 decision cases, while Alito and Kagan agree a mere 2% of the time.Furthermore, by the eye check, Kennedy does seem to live up to his reputation, but I turned to eigenvector centrality to tell us more. 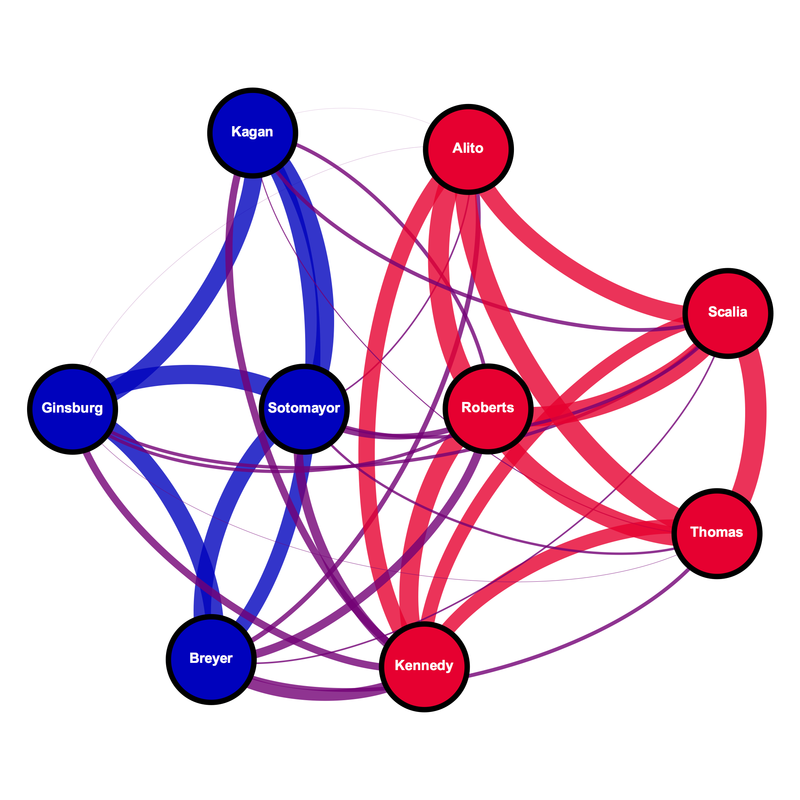 Decision agreement network amongst the current Supreme Court Justices on 5-4 split votes. Edges are proportionally scaled between the minimum and maximum values. Agreement matrix for 5-4 split decision cases. Once again, I compared the 5-4 decision network centrality scores to the predicted centrality scores. It is apparent that Kennedy truly is the swing vote when cases are highly contentious. 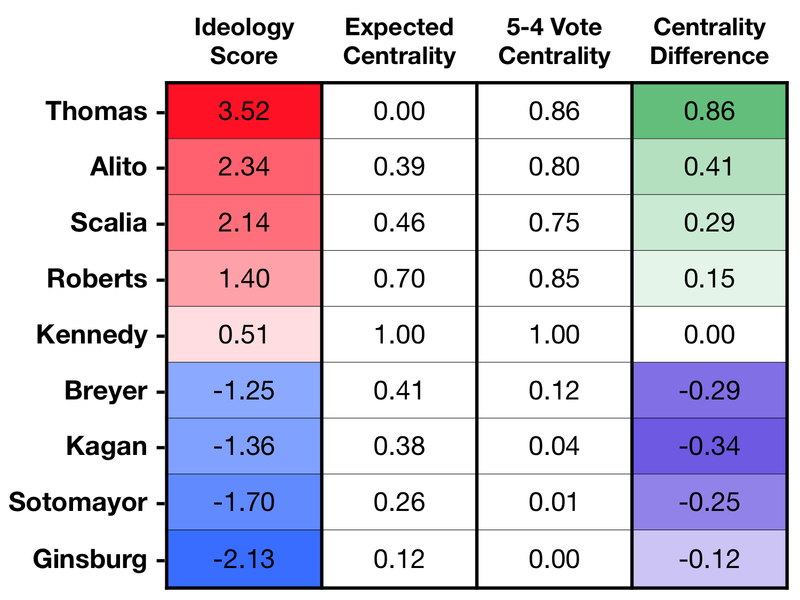 Of note, the liberal justices’ centrality seems to mirror their relative ideologies with the most liberal being the least central and the most moderate being the most central; however, this pattern does not hold up among the conservative justices. The liberal-conservative divide is quite noticeable as well, with all the liberal justices having low normalized network centrality. This highlights the fact that the 5-4 split decision often divides along ideological lines, with the liberal justices voting one way and the conservative justices voting the other. Once again, since the current court is a conservative one, the conservative wing is more likely to be in the majority, thus boosting their centrality scores. 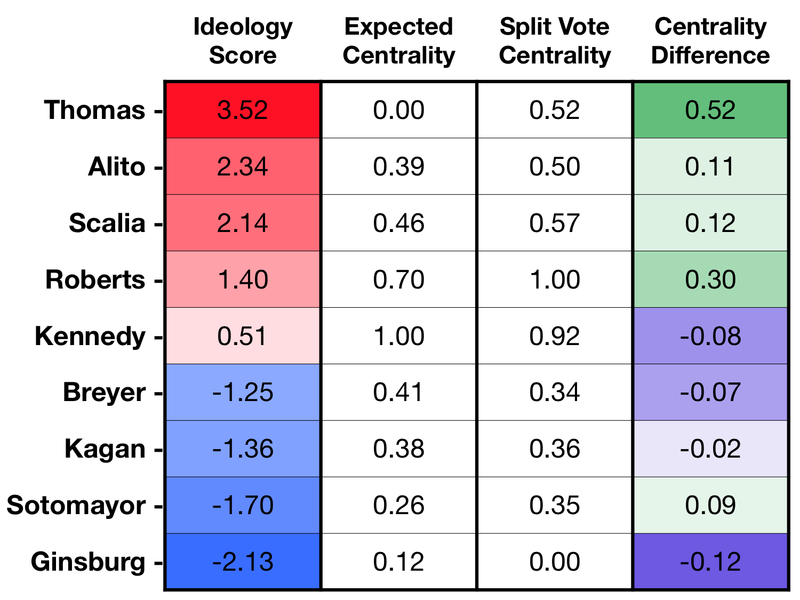 Table showing the normalized centrality scores as predicted by ideology score and as found in the 5-4 split vote network. This analysis revealed a few notable takeaways. Kennedy is the swing vote in 5-4 split decision cases, but he is less central than expected when considering all split cases. Surprisingly, Chief Justice Roberts seems the most agreeable when considering all non-unanimous court cases. Remember, the centrality metric is not only influenced by how often a justice is in the majority but also frequently they agree with those of opposite ideology. Thus, look not only to Kennedy but also to Roberts in the upcoming gay marriage case. 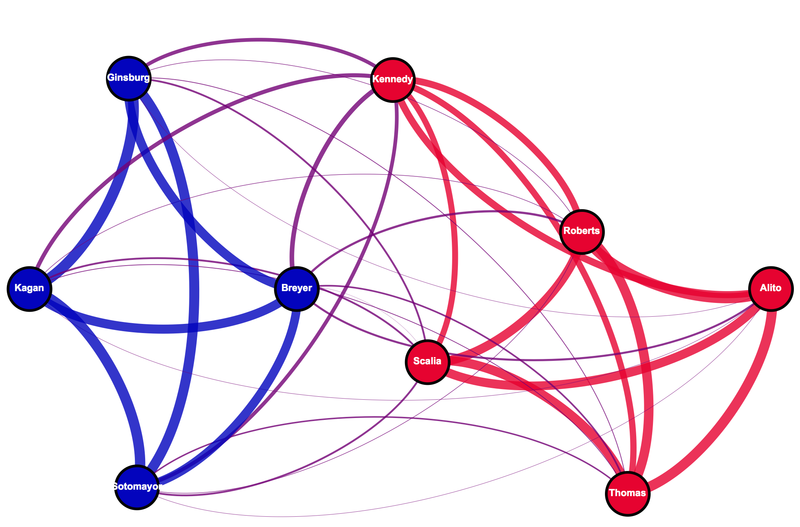 This social network analysis revealed the some of the dynamics of ideology. Conservatives seems to be more likely to vote in line with other conservatives, even if they are more ideologically similar to a liberal justice. This may also be influenced by the fact that court decisions are binary—a simple up or down vote. The data presented here was taken from the Supreme Court Database, a data archiving project supported by the National Science Foundation and various universities, including Washington University in St. Louis, the University of Michigan, and the University of Pennsylvania. The data was analyzed using the R programming language. The stringr and dplyr packages were used to prepare and shape the data, while the igraph package was used to calculate network statistics and output graph edgelists and nodetables. The final network graphs were created in Gephi. Given the pivotal role it has played in a lot of contentious laws as of late (Citizens United, challenges to DOMA and Obamacare, etc. ), there has been a lot of analysis — and quite a bit of concern and criticism — regarding the ideological dynamics of America’s highest court. This chart offers a pretty dense and comprehensive view of the subject. This was a great read. I would be cool if backtest your model on other past courts to see if they hold (e.g. can you predict who was the swing vote in the Bush v. Gore case). What made you decide to pursue this specific analysis? Did you model it after an analysis you saw before? Can I see the raw data and script you used? I decided to pursue this analysis after seeing that NYT article which presented an agreement matrix. I thought the data could be presented better. Then, I ended up dabbling further in network analyses. As for the data, you can find it on the supreme court database. Look for the justice spreadsheet download. I will post scripts and more to github once I get my account up and running. Next A glance at race and political affiliation: Independents represent!